I see Dylan hasn’t been blogging so I’d best do one for him. He’s keen on this social media thing, not the blog. We’ve had a busy week out every afternoon to mow Mummy’s grass for her. It needed it. She had to put me and Humphrey on the same patch two or three times in a row because there was so much to do. Colman and Kevin did well on theirs and finished the new patch she gave them yesterday in record time. Dylan and Dougall are finally settling down to their work now that Mummy stops Dylan getting over the fence. She puts the top of the cage over it. It means they have less of a run, but they work harder, so I suppose it’s good. I had a bit of a tummy upset on Thursday night and Mummy gave me Hugo’s special brew to help me along. It’s all right but I don’t know why Hugo liked it so much. Although I think he had to have Baytril which tastes horrid so most things taste good after that. She also gave me Hugo’s mint for breakfast which was yummy. This morning we went out on the grass straight after cuddles. That was unusual since the grass has been too wet for us right up till two o’clock up till now. Today it was dry, and all the vegetable patches in shade so we could have a nice rest and morning grass right up till midday. Well, me and Humph and Dylan & Dougall did. For some reason Colman was playing up and being very bossy. Kevin kept jumping on him so I don’t know whether he wanted to assert his rights to everything or what, but he found a way into Hec’s run and they had a mutual run-around. Well, that can be good, and Mummy watched them for a while as she had her breakfast. Then she could see that Hec wasn’t enjoying this at all, and kept avoiding Colman, so she separated them again. Then she took Kevin in so he left Colman alone, and then she took Colman in a little later since he kept trying to get into our run. 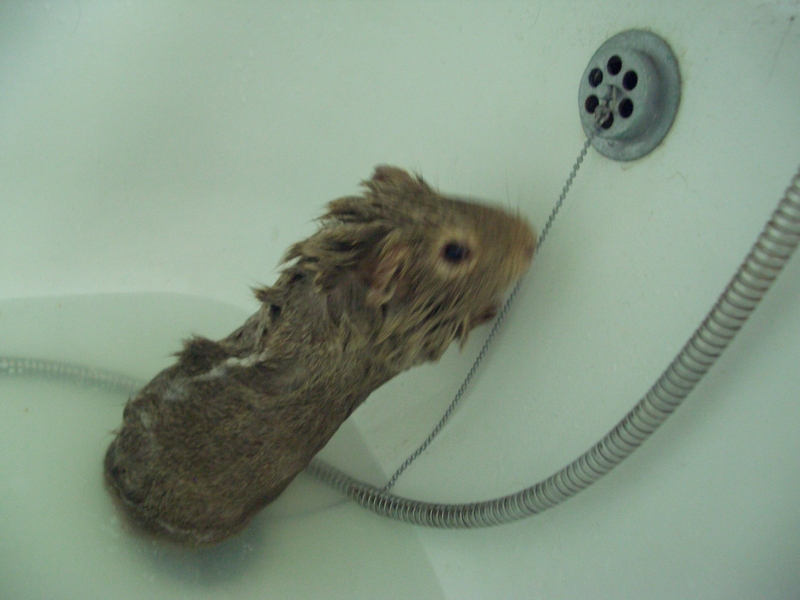 From the sound of things she gave them both a bath as we could hear water running upstairs. I know she’d already had her shower before she went out to get her paper and have breakfast. 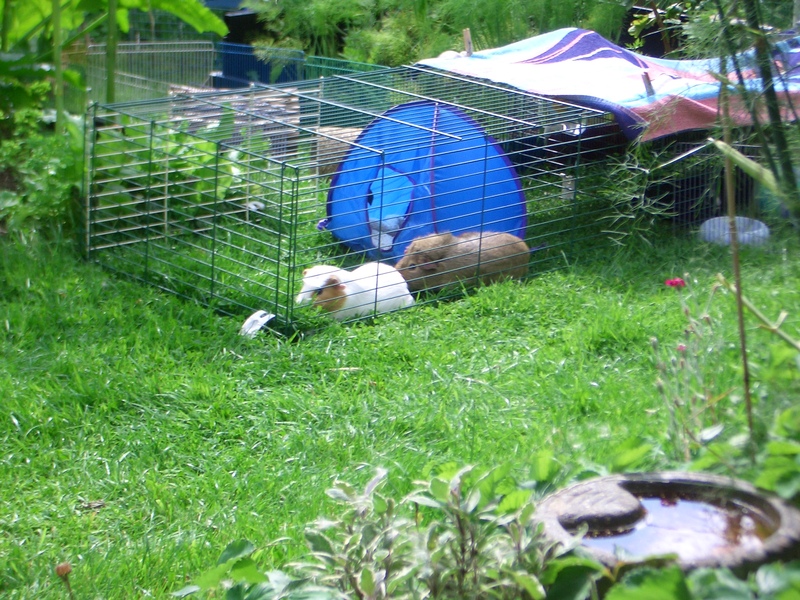 Anyway it all went quiet, and Humph and I ate some nice grass then moved into the shade. We kept having to move as the shade was getting smaller. Then just as we thought the shade was going to disappear Mummy brought us in to our nice cool kitchen. She is clever — all in all, not a bad slave. I’m glad that you boys keep her around. Thanks for posting, Vic. I miss you boys when you don’t post, but I know you have important mowing to do.